Sanford and Son was a Norman Lear sitcom about Fred Sanford (Redd Foxx) a cantankerousness widowed old junk dealer and his more level headed son Lamont (Demond Wilson). Together they own a junk yard in the Watts area of Los Angeles. Frequent visitors to the yard include Aunt Esther Anderson (LaWanda Page) who is Fred’s sister-in-law and constant thorn in his side, Grady Wilson (Whitman Mayo) who is Fred’s closest friend and Bubba Bexley (Don Bexley) another of Fred’s friends. The show was ground breaking in that it was the first prime time successful television series with an all African American cast. It was adapted from a British sitcom titled Steptoe and Son and even used many of the original sitcom’s scripts. After the sixth season, Redd Foxx quit the show to do Redd Foxx (1977). The series was set to continue with Demond Wilson (Lamont) as the lead. But Wilson left due to a salary dispute. 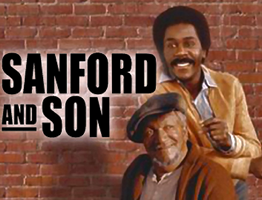 The show was retooled and became Sanford Arms (1977) which with neither Foxx or Wilson died after only four episodes. A running gag throughout the series was that whenever things did not go Fred’s way, Fred would clutch his chest and fake having a heart attack, shouting out variations of “Hear that Elizabeth? I’m coming to join you honey!”, yet no one would fall for his ruse. 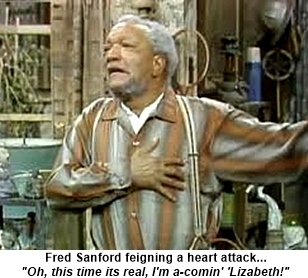 Ironically, this running gag would years later be considered contributory to Redd Foxx’s death from a real heart attack. In 1991, during filming of the series The Royal Family, Foxx started complaining of chest pains, the rest of the cast thought he was pulling a gag and started laughing, robbing him of several critical minutes of help. He died later that night at the hospital.